Do you want to create a survey in WordPress? With a well-designed survey, you can easily collect useful information, feedback, and opinions from your site visitors. You can then use the collected information to make informed decisions for improving your business strategies. In this article, we’ll show you how to easily create a survey in WordPress and build beautiful reports. The process of creating a survey and using the collected data can be really easy if you choose the right survey tool. But which one should you go with? Deciding can be difficult, given the presence of several online services that let you create survey forms and embed them on your WordPress site. These tools all work fairly well for what they are; however, they come with numerous drawbacks. First, they store your collected data on third-party servers which you cannot easily access. Second, they offer limited customization options. Plus, some of them limit the number of responses you can collect. Fortunately, you don’t need to worry anymore because there’s WPForms, the world’s BEST plugin for making surveys in WordPress. WPForms is a user-friendly simple drag and drop WordPress form builder that helps you create any type of form including a simple contact form, order form, donation form, etc. And it comes with the survey forms addon that lets you make WordPress surveys easily, and provides you with beautiful survey reports. Smart survey fields like Rating, Likert scale, multiple choice, etc. Options to easily embed the survey forms in posts, sidebars, footers, etc. Beautiful survey reports with graphs, charts, and tables. Above all, WPForms comes as a single solution to every type of form you’ll ever need. So, you don’t need to use multiple plugins on your site. 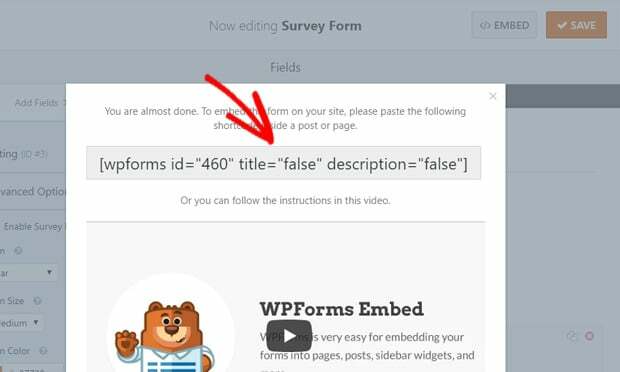 Now, let’s go ahead and check how to easily create a survey form in WordPress using WPForms. First, you’ll need to install and activate the WPForms plugin on your WordPress site. If you don’t know how to do that, here’s our step-by-step guide on how to install a plugin in WordPress. After you’ve successfully activated the plugin, you’ll see a new WPForms menu added to your WordPress dashboard menu. From there, go to the Addons submenu and you’ll see the Survey and Polls addon along with other addons. Next, you’ll need to click the Install Addon button to install the addon. Then, don’t forget to Activate the addon. 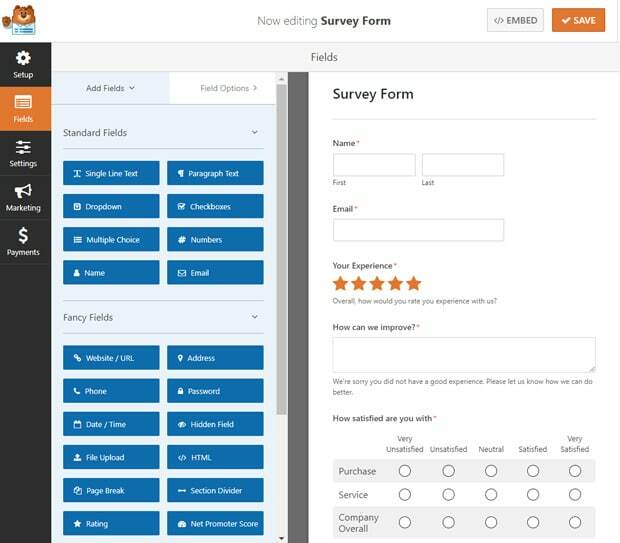 Now you’re ready to create a survey form with WPForms. To get started, go to WPForms » Add New from your WordPress dashboard. There, you’ll see different pre-made form templates. Select the Survey Form template. WPForms will provide you with a ready-to-use survey form. You can use this form simply without any customization if this suits your needs. Just click the Save button for that and head to step 3. If you’d like to customize your form, keep reading on to step 2. The pre-defined survey template comes with plenty of fields for a survey; however, you can effortlessly make some changes to it, if you desire. 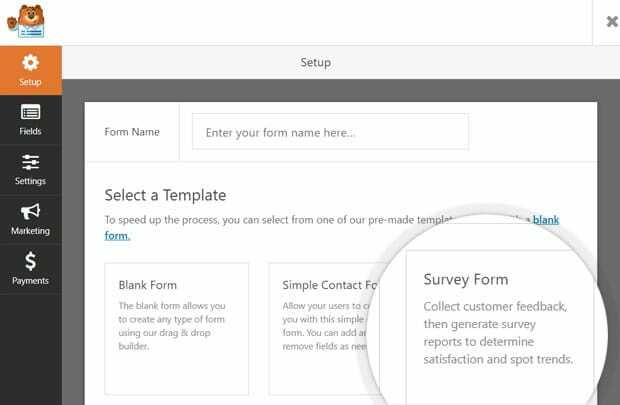 WPForms allows you to completely customize the survey form your way. You can add additional form fields by simply dragging them from the left-hand side panel to the form-building interface on the right-hand side. 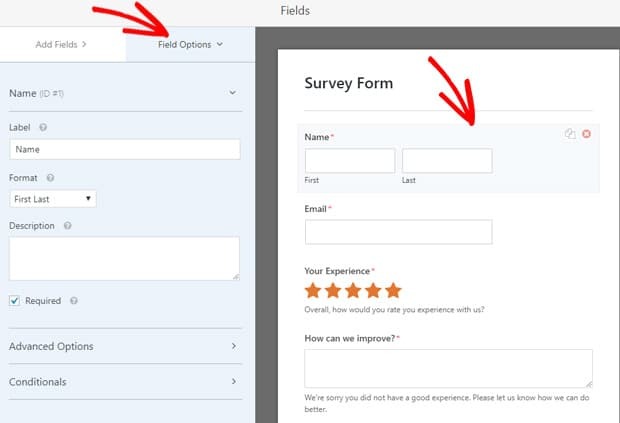 Then, you can reorder and rearrange the fields on your survey form. If you want to edit any field, you can point and click on the field. Then, you’ll see the Field Options open in the left column. You can change the label, format, description and enable Required for your fields from there. Similarly, if you want to customize the rating field, you can simply click the field. Then, you can see the field options open in the left column. Now, you can change the field label, description, and scale for the rating between 2 stars and 10 stars. Then, if you click the Advanced Options, you’ll find options to choose an icon, icon size, icon color, and CSS classes, etc. You can also enable conditional logic by clicking on the Conditionals. After you’ve customized your fields, don’t forget to click the Save button. The next step is to configure the Survey Form settings. 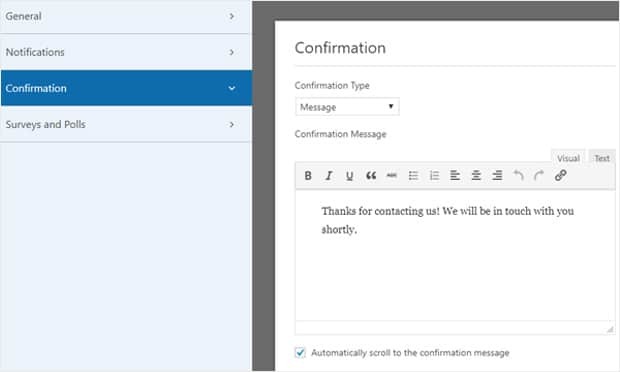 To configure the form settings, you’ll need to click the Settings menu in the WPForms menu on the left-hand side. Then, you’ll see 4 settings to configure. You can edit your form name, form description, submit button text, submit button text processing text, option to enable anti-spam honeypot, Google reCAPTCHA, etc. from there. Second, you’ll see Notifications settings. 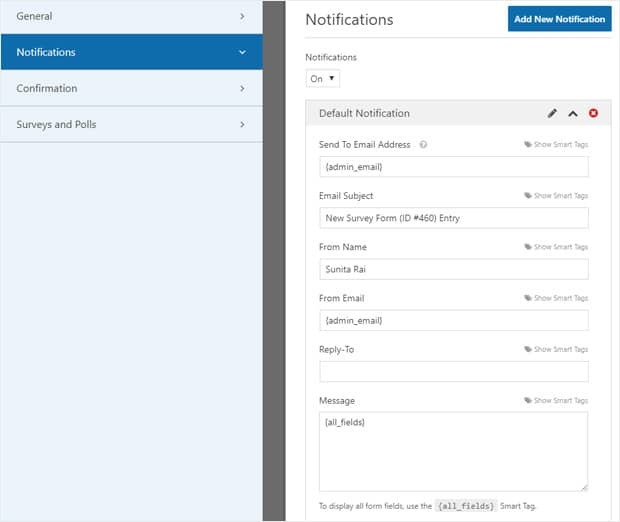 This lets you configure how you want to receive an email after someone completes your survey form. You can turn on or off the notifications from this page. If you turn it on, you’ll see a default notification setting which you can review and edit as per your needs. Third, you’ll see the Confirmation setting. It’ll let you set the confirmation message your users will receive after they complete your survey form. Fourth, and last, is the Survey and Polls setting. It’s where you can enable survey reporting. If you click on the Enable Survey Reporting checkbox, it will enable survey reporting for all your forms sitewide. This will collect survey results for the following fields in all your forms. Hence, it turns all of your forms into surveys. If you want to collect the survey reports for all of your forms, you can keep this enabled. But if you want to enable this for a particular form only, you have to uncheck the Enable Survey Reporting box and save. 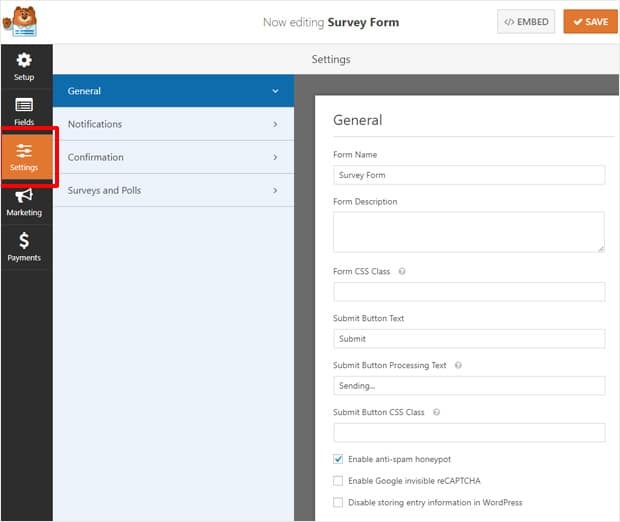 Then, open the respective form you want to enable survey reporting and click the survey field to edit. In the Field Options, you’ll need to click Advanced Options. There, you’ll find Enable Survey Reporting checkbox. Simply click the box and save. 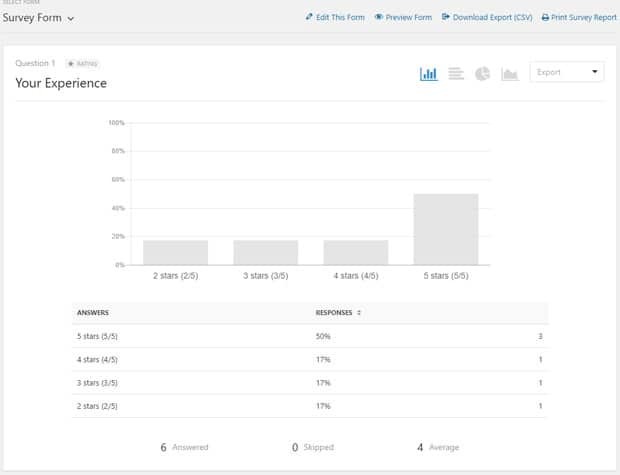 Now, WPForms will generate reports for only the fields you’ve enabled survey reporting. Once you’ve created a survey form, customized, and configured your settings, you can embed it on your WordPress site. 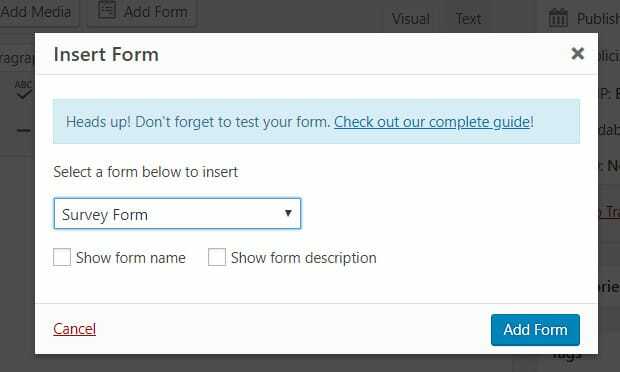 WPForms makes it really easy to embed forms in WordPress. 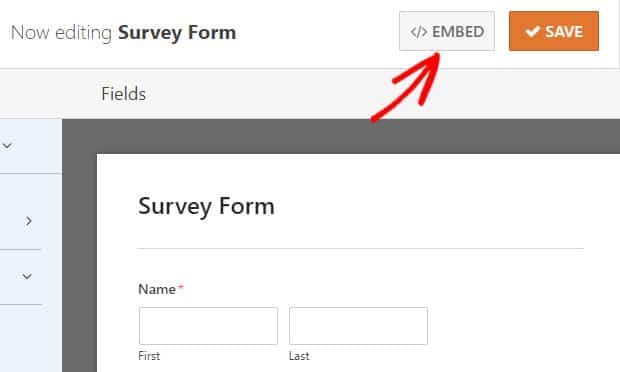 There’re 3 main ways to embed your survey form in WordPress. First, you can find the form shortcode in the Embed button in your form editor page just before the Save button. You can simply click the button, and you’ll get a shortcode. Now, you can copy the shortcode and paste it anywhere in your pages, posts, or in a text widget. After you’ve added and saved the post / page / widget, you can open that page and preview your survey form. Second, you can directly embed it from your post / page editor. As you edit a page / post, you’ll find an Add Form button in the post editor toolbar. Simply click the button and select the survey form you want to add. Then, update your page / post and preview the survey form. The third method is using the WPForms widget. To add the survey form into your sidebar, footer, or any widget-ready area, you can use the widget. Simply visit Appearance » Widgets from your WordPress dashboard and drag the WPForms widget to the any widget-ready area on the right-hand side. Then, select the Survey Form you want to add and click the Save button. You can preview your survey form by visiting your site’s widget area in the front-end. After people start filling out your survey form, you can see the collected data in survey reports. To view the survey data, you’ll need to visit WPForms » All Forms first. There, you’ll see the list of all your forms. Then, go to the survey form you want to view the report for and hover over it to view its options. Then, click Survey Results to view your survey data. Then, you’ll see results for each of your survey questions. The default data view option is a bar chart which you can simply switch to pie-chart, line chart, etc. by clicking the icons. Next to the data view icons, you’ll see an Export drop-down box. By clicking on that, you can export your reports as JPEG, PDF, or print. Looking for a Plugin to Track All Type of Forms? 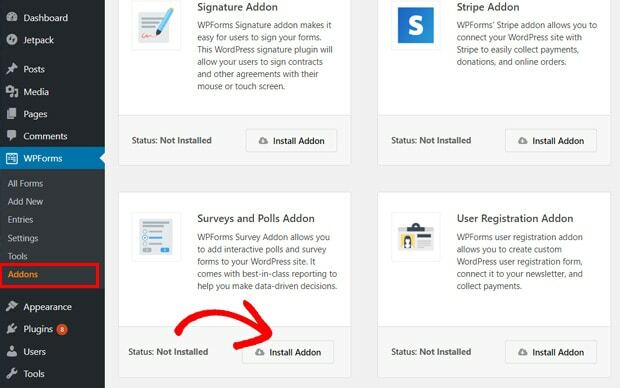 If you want to view reports for only the survey fields, the WPForms Survey and Polls addon is perfect. 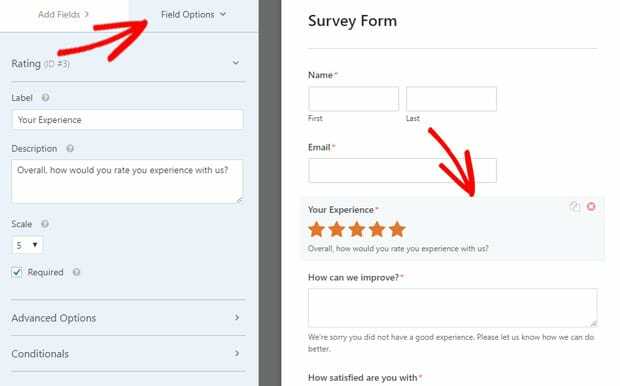 But, if you want to track all types of forms, including those without the survey fields (like Rating and Likert scale), you’ll need to use the MonsterInsights plugin. The plugin comes with a Forms tracking addon which will help you to track the overall performance of all your WordPress forms. 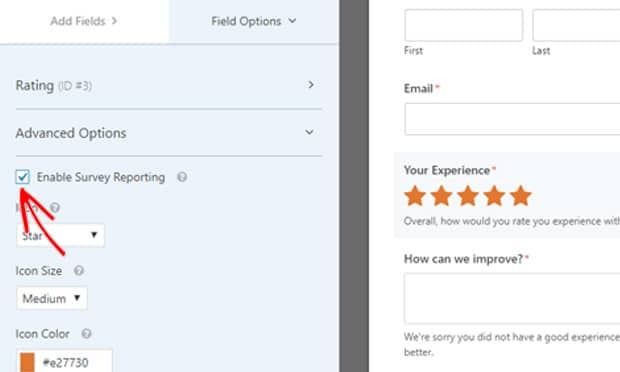 If you’re wondering what the difference is between the Survey Form results and MonsterInsights forms report, we can say that the first one is a survey-specific report but the second is your forms’ performance report. 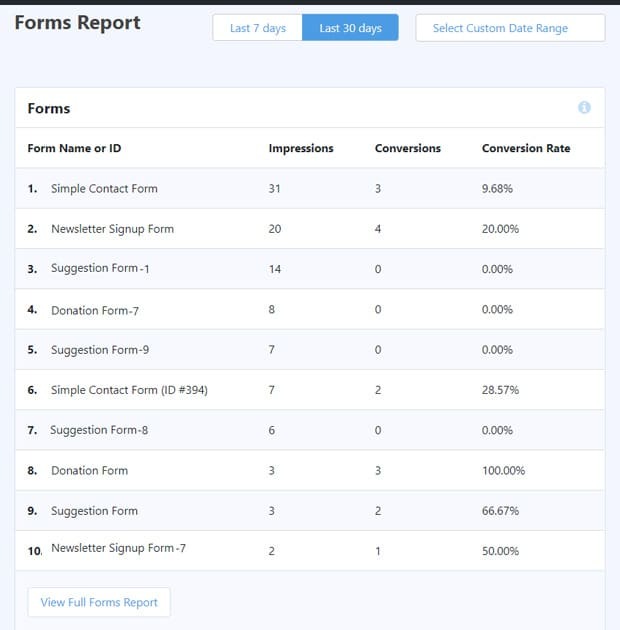 WPForms Survey results show you how people responded to your survey questions, while MonsterInsights Forms report shows you how many people submitted your forms. If you want to learn more, here’s our complete guide on how to track WordPress form conversions using MonsterInsights. 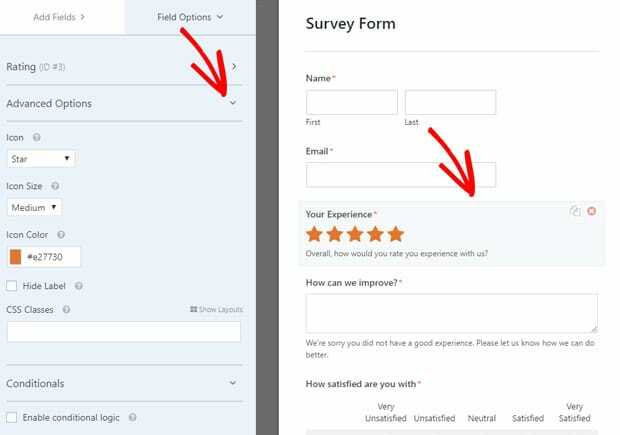 We hope this article helped you to learn how to create survey forms in WordPress, and how to generate beautiful result graphs. You might also want to check out our guide on how to create a contact form in WordPress.